Well, I couldn’t let Snuka out of that whole Lillychinatown deal without having him run into a couple of Kung Fu flick cliches. 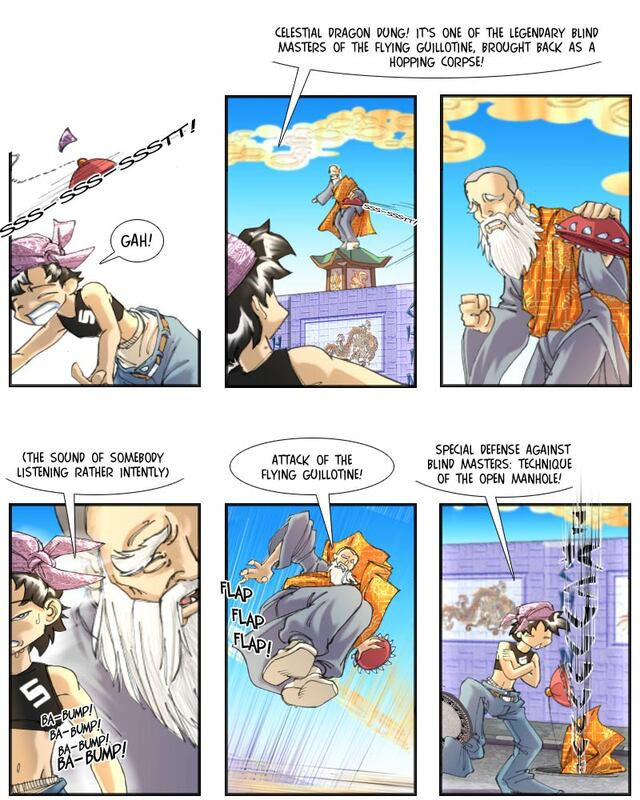 And I thought I should go for the top, here, and take one of the most outrageous: old, decrepit, blind, but nevertheless invincible martial arts masters. Yes, in martial arts movie lore losing your eyesight is something that just makes you a stronger fighter, easily offset by accute hearing (Blind Pew: “I may be blind, but I ‘ave accute ‘earing” Commander Clement: “I’m not interested in your jewelry.”) and the general increase in speed, agility and strength that comes with being old and decrepit. Bonus invincibility then comes with using the most ridiculously impractical weapon you can find. For an example, take Master of the Flying Guillotine, a movie which would have been more aptly titled “How the One-armed Boxer needed 70 minutes to come up with a way to lure an old, blind, sickly monk into a deathtrap”. An old, blind, sickly monk who has an additional handicap in his use of the legendary “Flying Guillotine”, a distance weapon (ideal for a blind man) that needs to be perfectly aimed to land over the head of its target – in short, suitable for anybody who considers just throwing a knife to be too easy by a full order of magnitude. The death trap that finally does away with the poor blind guy in that movie is of a pointless complexity that would have done Fu Manchu proud, involving a coffin shop prepared with custom-made axe-chugging devices. Snuka, naturally, went for something more straightforward. Bushy eyebrows are a pre-requisite for blind martial artists in movies – for practical reasons. It seems that in real life, stuntmasters don’t actually get better with losing their sight, so blind masters tend to be depicted by seeing stuntmen/actors…and they naturally need something to cover up their surreptious peeking every now and then. Today’s new voting incentive is DBZ-themed. More on Monday.